Tesla, Inc. (formerly Tesla Motors, Inc.) uses a marketing mix that stands out in the automotive industry. The marketing mix or 4Ps (Product, Place, Promotion & Price) is the set of strategies that a company uses for its marketing plan. Tesla maintains significant managerial control in all components of its marketing mix. Such level of control maximizes the company’s effectiveness in reaching its target customers and optimizing profits. As a major producer of electric automobiles in the United States and other countries, the corporation continues to use its marketing mix to support market penetration and potential expansion in overseas locations. Market penetration is included in Tesla Inc.’s generic strategy for competitive advantage and intensive strategies for growth. The company’s 4P supports competitiveness against other automakers, such as Toyota Motor Corporation, General Motors Company, Honda Motor Company, Volkswagen, Nissan Motor Company, and BMW (Bavarian Motor Works). These competitors also employ strategic 4Ps to address the approach that Tesla Inc. uses in the automotive market. In using its marketing mix or 4P, Tesla, Inc. grows its brand popularity along with increased market penetration. Elon Musk’s popularity adds to the promotional effectiveness in strengthening the brand. The brand is a major business strength identified in the SWOT Analysis of Tesla Inc. For example, the brand helps the company attract more customers, thereby also supporting marketing campaigns. The Place and Promotion components of the 4P make Tesla’s marketing mix unusual in the automotive industry. Tesla is known for its electric vehicles. For example, the company’s Model S sedan is one of the world’s most popular electric cars. However, aside from cars, the firm also manufactures powertrain components for electric automobiles that other auto firms produce, thereby satisfying its mission and vision in facilitating the world’s movement toward electric vehicles and sustainable energy (see Tesla’s Corporate Vision & Mission Statements). Moreover, the company offers batteries for home and industrial use. In relation, upon acquiring SolarCity Corporation, the company expanded its product mix to include solar panels and related installation services. This element of Tesla’s marketing mix shows focus on electric vehicles, as the company currently seeks to grow and expand its multinational business. The company’s strategies support profitability in this element of the marketing mix. 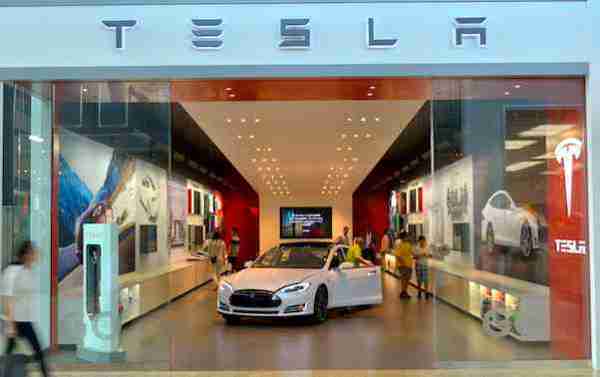 Customers can check Tesla’s automobiles, energy storage, solar panels, and related products at company-owned stores and galleries located in malls and other areas. However, customers need to use the company’s website to complete sales transactions. Also, Tesla owns its service centers, where customers can access repair and maintenance services, and where the firm can render services as part of its sales contracts. Moreover, customers can charge their cars through the company’s charging stations. These venues reflect the company’s selection of limited but strategic locations for its business. Thus, the place element of Tesla Inc.’s marketing mix highlights significant corporate management control on the sale and distribution of products. Tesla’s marketing mix is unusual in the automotive industry, partly because of its dependence on viral marketing. Viral marketing has the biggest contribution in the company’s promotional communication with target customers. For example, the release of the Tesla Model S for Kids is largely promoted through viral videos on social media, thereby also promoting the company’s product mix. Personal selling is a 4P strategy implemented through sales personnel at company-owned stores and galleries. In addition, Tesla uses public relations to manage and boost its popularity. For example, the company’s inclusion of its patents in the open-source movement is a testament to the company’s commitment to driving the world’s transition toward sustainable energy. Such programs improve customers’ perception about the organization and its brand. On the other hand, sales promotions involve discounts for certain items and the company’s customer referral program. Occasionally, the company uses direct marketing, such as selling powertrain components and batteries to other businesses. In this element of the marketing mix, viral marketing significantly determines Tesla’s effectiveness in promoting its products and brand. Tesla, Inc. uses a premium pricing strategy. This primary pricing strategy involves high price points on the basis of uniqueness or high value attributed to the company’s products. For example, customers are willing to pay relatively high prices for Tesla automobiles, which are considered advanced in terms of technology and ecology. Thus, innovation and product design are significant factors in successfully using the company’s approach to this part of the marketing mix. Premium pricing agrees with the generic strategy of differentiation, which emphasizes uniqueness of products. In addition, the company uses the market-oriented pricing strategy for its solar panels and related products (services) through the subsidiary SolarCity. This 4P strategy helps maintain competitiveness in a rapidly changing industry and manages the strong force of competition determined in the Porter’s Five Forces analysis of Tesla Inc. It is expected that the company will change or add new pricing strategies to account for new products and trends in the transportation industry and energy solutions market. Antonella, S. F. (2017). The effects of marketing mix (4P) on companies’ profitability: A case study of automotive industry in France. Journal of Research in Marketing, 8(1), 636-640. Liu, Y., Li, K. J., Chen, H., & Balachander, S. (2017). The effects of products’ aesthetic design on demand and marketing-mix effectiveness: The role of segment prototypicality and brand consistency. Journal of Marketing, 81(1), 83-102. Tesla, Inc. – Find Us. Tesla, Inc. – Referral Program.